I remember playing my first Mario game back in the 90’s. I spent so much time trying to beat Super Mario Bros. Deluxe on my Gameboy Color. I haven’t bought a Super Mario game for a handheld console since, until Super Mario 3D Land. 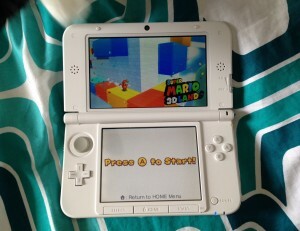 Super Mario 3D Land is a game where you get to explore and walk through the different levels. Your goal in this game is to get to the flagpole before time runs out. Of course you have to avoid being hurt by enemies, stepping on spikes, lava, or just falling into the abyss. You can also try to find the three stars hidden in each level. This game does not restrict you to a certain path, but lets you walk freely through the world. I had never played a Mario game that allowed you to wander through the levels. I am very used to the scroll-screen play where you just jump over things and attack enemies as you go. It was an interesting experience to not have a designated route to take. The game itself I found to be pretty easy, but finding the stars hidden in the levels made the game more interesting. The one downside (in my opinion) is the game will give you a flying, invincible Mario if you lose a life a few times in a row. While this might be nice for younger children, it kind of took some of the challenge away. All in all Super Mario 3D Land was a pretty good game. I enjoyed playing it, but it wasn’t very challenging with the “assists” that the game gives you, and could easily be completed in a few hours (if you aren’t looking for the hidden stars). This entry was posted in Video Games and tagged 3DS, Video Games by Sarah. Bookmark the permalink. Cheers lots, been recently in search of this for a while currently. Thanks, Tom. I�ve just recently created a FaceBook �page� for my site and agree with TJ that it doesn�t necessarily naturally gather traffic even through 500 million users. I�ve been exploring ways to promote traffic there, but it�s not easy to stand out in FaceBook. I�ve typically used it as Stacy has by just announcing new blog posts there, but need to find creative ways to boost followers. Very nice tips. I opened a new account in twitter. Hope these tips will help me. Just finished setting up our timeline on Facebook, thanks to this wonderful post of course! Thank you for all your effort, and keep up the good work! Looking to buy. Is it just the first image of a standard post and some text that makes up snippet on timeline, or is it featured image? Hi there, I check your new stuff regularly. Your writing style is witty, keep up the good work! article or book is similar to a rifle in the hands of an infantryman.